Unfinished white oak wood baseboard registers give you the power to stain them to match your existing floors or trim. 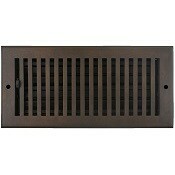 These air vent diffusers can be used as both bottom and rear feed baseboard vent covers. The wood baseboard registers have a flap damper which allows the air vent diffuser to be either open or closed. 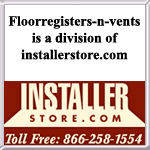 Installation of your wood baseboard register is simple. The faceplate of the air vent diffuser is easily removed, and the frame of the wood baseboard register is screwed into place along the baseboard. Then replace the solid white oak air vent diffuser faceplate and you are finished. Furthermore, because the wood baseboard register faceplate is easily removable you can easily clean and maintain your ductwork. 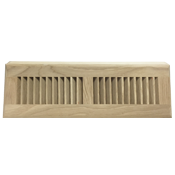 White Oak baseboard air vent diffusers in a natural finish are also available. Upgrade your air vent diffusers with these beautiful white oak wood baseboard vents.